Samurai Marathon 1855 is an upcoming film adaptation of novelist and screenwriter Akihiro Dobashi’s 2014 novel Bakumatsu Marathon Samurai. It is based on the Ansei Tooashi, a historical race said to have been the origin of marathons in Japan. It has been held every year for 160 years since the Edo period when it was first carried out by the local lord of the city of Annaka in 1855 for his troops. The film stars a line-up of big names in Japanese film including Takeru Satoh, Nana Komatsu, Mirai Moriyama, Shōta Sometani, Munetaka Aoki, Naoto Takenaka, Etsushi Toyokawa, and Hiroki Hasegawa as well as Academy Award winning staff. A video of the marathon start scene was posted on GAGA Corporation’s official YouTube channel. The film is set during Bakumatsu, the final years of the Edo period when the reign of the Tokugawa shogunate came to a close. A threat looms from foreign countries. To drill his position Katsuakira Itakura, the feudal lord of Annaka, sends his troops on a 58km run. The rally is supposed to be one where the winner is granted whatever he desires, but a wrong route is taken and interpreted as treason towards the Bakufu (Tokugawa shogunate), resulting in assassins being sent to overthrow the lord and the castle where he is absent from. However, a single man is aware of the approaching crisis, and runs to stop their plan. The video shows the troops at the start line and ready to run with all of their might. They are watched over by the lord Katsuakira Itakura (played by Hiroki Hasegawa). Jinnai Karasawa (Takeru Satoh) is the Bakufu spy who knows of the impending crisis and starts running. The lord’s daughter Yukihime (Nana Komatsu) sees what will happen in a dream and dresses as a man to escape the domain. Heikurou Tsujimura (Mirai Moriyama) is a prideful and arrogant samurai who will do whatever it takes to win so that he can marry Yukihime. 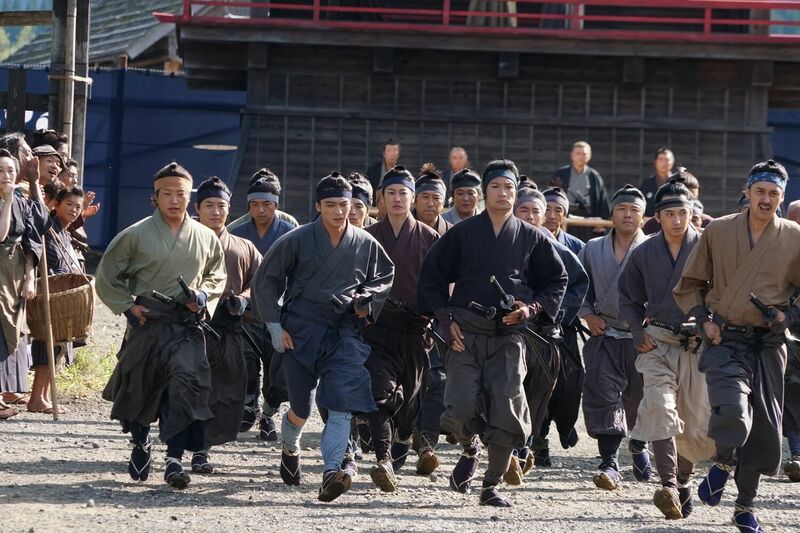 Hironoshin Uesugi (Shōta Sometani) is the fastest foot soldier in the domain who says he will hand over his money if he does not arrive in first place. Yoshikuni Ueki (Munetaka Aoki) is a senior authority that participates in the run despite troubling pain in his lower back. Mataemon Kurita (Naoto Takenaka) is an elder samurai who strives to make his name known in the world once more. The film is directed by English filmmaker and screenwriter Bernard Rose (Candyman, Immortal Beloved) who required actors with a “strong sense of conveyance” in their performance ability. Being directed by a non-Japanese means that it is sure to be enjoyed by audiences outside of Japan too despite any subtle Japanese nuances. Look forward to the newest samurai movie releasing on February 22, 2019. Screening at TOHO Cinemas Hibiya and elsewhere.